It has to tingle, fascinate, polarise, create hope and allow you to dream - that’s when it’s good. 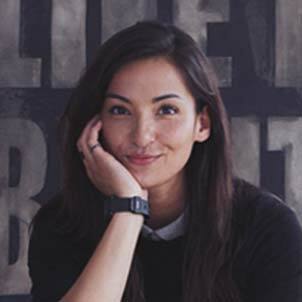 When referring to creative fields and techniques the word ‘limit’ is not a part of German designer Sarah Bühler’s vocabulary. In addition to her creation of visual art she is a maker of music and works as a model. Her creations can be anything from a carefully constructed collage of analogue photos to an exciting experiment in digital vector graphics. She loves losing herself in every new project she embarks upon. Every poster she designs is only deemed finished when she steps back and decides that it is ready to go up on the walls of her home. Style-wise her posters are completely detached from the more traditional designs she creates as a freelancer to meet the expectations of agencies. She is always looking for new challenges and spheres to discover as an artist. In all its entity, her aesthetic embodies clarity, structure, authenticity, freedom and a delight in experimentation.